There's Greenhills, Quiapo, Baclaran, Marikina, SM Malls but the mother of them all is Divisoria. 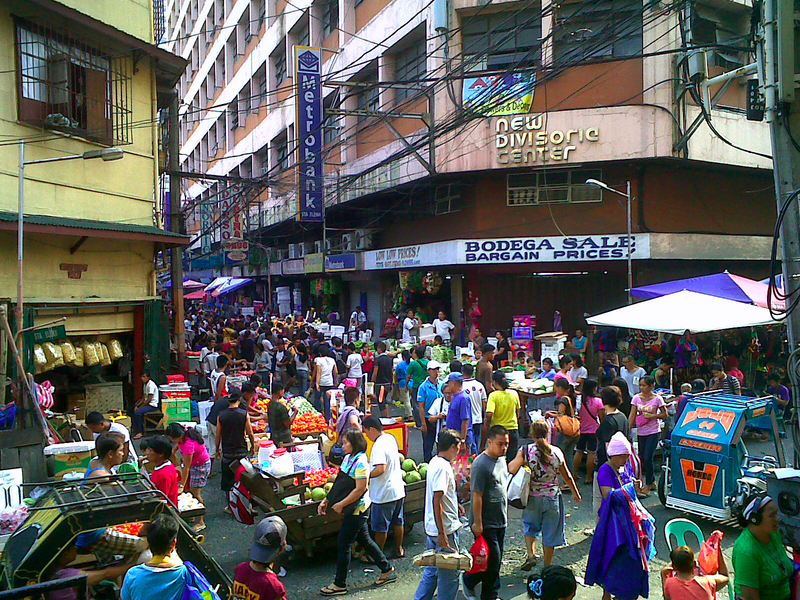 Divisoria is the biggest and the cheapest shopping place in the Philippines (as far as i know...). Its the place to go if you want bigger savings. A sacred place for business owners all over Metro Manila and nearby provinces. Most of the people I know have gone to this place, but there are still many who don't know how to get there or have no intentions of going there at all with all kinds of reasons.Divisoria have a reputation of having low prices but poor quality products. That might be true with some products with prices 70% cheaper. Original and high quality products can also be found there with low prices depending on quantity and one's negotiating skills. If you really want the very best price from Divisoria, learn about the word "wholesale" before going there. Some say the place is chaotic with snatchers roaming around. Its not that bad if you bring your street smart attitude with you (as you do while in other public markets). At first, the whole place seems like a big mess. Aside from the crowd and heat, all sorts of stuff from clothes, etched stone to bed foams are scattered around the streets. But once you get familiar with it you'd want go there as often as possible.It's so easy to get lost in Divisoria. Shoppers, vehicles and delivery boys moving in all directions and manner. You'll learn running sideways in or or out of malls of Divisoria. Don't worry, you'll be alright because aside from bargain prices, you can check out the Korean and Chinese store owners and half-naked muscled delivery men. Kidding aside, the main malls of Divisoria namely New Divisoria Mall, 168 Mall and Tutuban Shopping Center are fully air-conditioned which makes shopping easy. Anything available in more famous malls like SM, Glorietta and Landmark can be found in Divisoria, but with lower prices, but first you have to know where to find them. Now on to our journey. Discover Divisoria. Note: The broken lines are my suggested route for begonners. This map is created exclusively for TaraLETS.com. If you are going to re-repost this to you website or blog, please include the TaraLETS.com link along with it. Thank You. 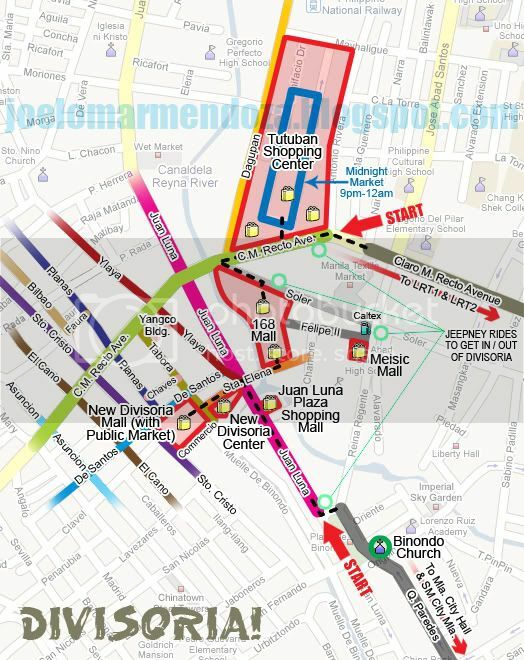 Take the MRT, get off at Taft Station, Then take LRT-1 going to Doroteo Jose then walk towards Recto. From the MRT, you may also get off at Cubao Station, then ride LRT-2 and get off at Recto. At Recto, just ride a jeepney with Divisoria sign on it. There are also jeepneys coming from Mabini, Malate, Manila City Hall areas going directly to Divisoria, passing Binondo Church. Divisoria is dissected by C.M. Recto. Sta. Elena: strawberries and other fruits, tissue rolls, fried street food, 168 Mall - Bldg 1, New Divisoria Mall, New Divisoria Center (party supplies, toys, decorations and giveaways). Santo Cristo (left-side of Recto): school & office supplies, crackers, macaroni, sweet corn, gift wrappers, fancy jewelry, bracelets, bakery products. Ylaya (left-side of Recto): fish, chicken, pork, eggs, string beans, eggplants, etc. Expect a wide variety of products and "IN" or in demand stuffs of the season can be found in these malls.